Tried to install ASP.NET AJAX Control Toolkit v15.1 from Nuget but the updated version is only V8.0, How do I get the latest thru Nuget in VS2013? the site says 30-day free trail. so it is no longer free? I have installed in my machine and didn't see the 30 days trial period. At the bottom of this page, it says so. Firstly, I’m glad to hear that you resolve the problem with the help of A2H. Secondly, the available latest version of the AJAX Control Toolkit is V8.0.0 via Manage NuGet Packages in Visual Studio2013. Confused... How about v15.1? 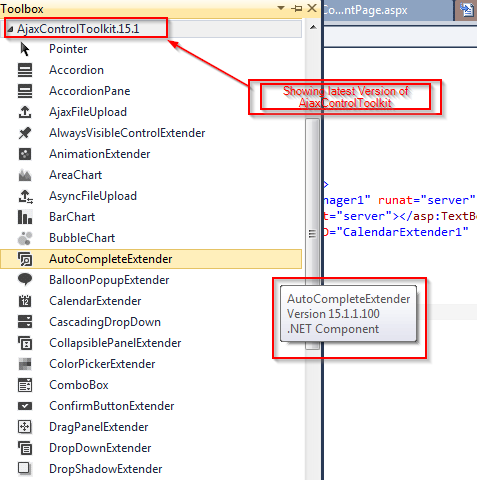 I'm looking for AsyncFileUPload control but it's not in the latest from NuGet. Actually I'm still having problem. I downloaded V15.1, I can see Toolbox has been updated to 15.1 and AsynchFileUpolad is there but I'm getting Element AsyncFileUpload is not a know element. I have checked that assembly has already been registered. AsynchFileUpolad is there but I'm getting Element AsyncFileUpload is not a know element. Looks like your control is not registered properly. How did you add the control to page.